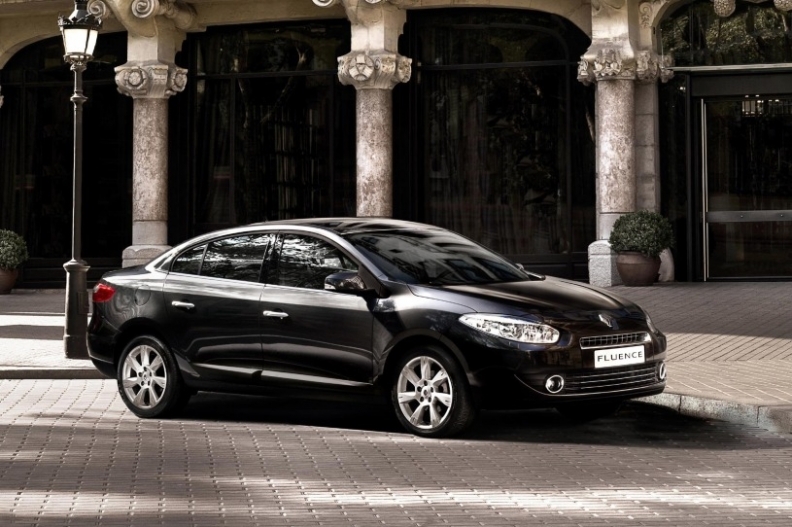 The Renault Fluence, pictured, will compete for customers in India with the Toyota Corolla and VW Jetta. MUMBAI -- Renault SA aims to sell 100,000 cars a year in India by the end of 2013, as the French carmaker introduces its first model in the Asian country since exiting a joint venture with Mahindra & Mahindra Ltd. last year. The carmaker will introduce the Fluence sedan May 23 in New Delhi and plans to sell as many as five models by December 2012, when it expects to have 100 dealers across the country, Marc Nassif, the carmaker's general manager for India, said. "We'll try to deliver more and make the brand more visible," Nassif said. "We will grow from zero at the moment to 100,000 by the end of 2013." Renault aims to capture at least 5 percent of the Indian auto market by 2020 as it expects local vehicle sales to more than triple to 6 million a year. The Fluence will compete for customers with Toyota Motor Corp.'s Corolla model and Volkswagen AG's Jetta, Nassif said. Toyota sold 10,707 Corollas in India in the year ended March 31, according to data from the Society of Indian Automobile Manufacturers. Nassif declined to reveal the model's price before the introduction. India's car-sales growth may slow to 18 percent in the year started April 1 due to higher prices and rising borrowing costs, Pawan Goenka, president of the auto-industry group, said April 8. Sales surged 30 percent, the most in at least nine years, to 1.98 million in the year ended March, according to the group. Toyota said in March it would raise Indian plant capacity 40 percent to 210,000 cars a year by September because of surging demand for Etios, Corolla and Fortuner vehicles. Ford Motor Co. intends to add eight models in the nation by 2015. Renault will build the Fluence, the Koleos sport-utility vehicle and three other models including a hatchback, another SUV and a sedan in a plant it shares with affiliate Nissan Motor Co. near Chennai in southern India. Nissan and Renault will double the plant's capacity to 400,000 cars a year by next year, Nassif said. Mahindra, India's largest maker of sport-utility vehicles, agreed to buy Renault's 49 percent stake in a venture that made the Logan sedan in April last year. The companies didn't provide financial details. On April 26 this year, Mahindra announced it would rename the Logan as the Verito and sell it under the Mahindra brand. The Mahindra-Renault venture was the only company among the 16 car manufacturers in India to report a decline in sales in the year ended March 31, 2010. Sales have since almost doubled. The venture lost 4.9 billion rupees ($109 million) in the year ended March 2009, according to the Indian company. The Fluence and the Koleos will initially be built from kits and later have their engines built in India with more local parts, Nassif said. The next three models will be localized "massively," he said. "We know that if we have to succeed in India, we have build in India and source in India," Nassif said. Renault also plans to more than triple its global component sourcing from India to 100 million euros ($143 million) this year after it got 30 million euros worth of parts from the nation last year, Nassif said. The company will offer financing to its Indian customers, Nassif said, declining to comment on how many banks it would collaborate with.